Note: For a two-page summary of this inspiring seven-page WingMakers essay, click here. Each individual on Earth is exploring in a physical body new ways of experiencing life. Through this process of discovery, each of us is developing a deeper level of understanding of life and a greater ability to express our divine essence. This divine essence is the fullest expression of each individual's soul, and most closely exemplifies the Divine's capabilities therein. Divine essence is a level of divine awareness that was "seeded" within each soul when it was initially conceived by the Divine. It is also the natural state of the soul that has removed itself from the controlling aspects of hierarchical belief systems through the complete awakening of its sacred intentions. 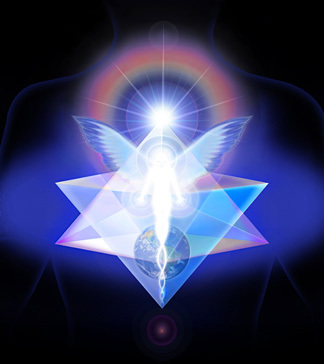 All souls are in various stages of transformation, and all are destined to attain a level of conscious awareness of divine essence as their sacred intentions are fully awakened. Profound personal transformation is initiated by the realization that you are capable of direct access to the Divine. This is the realization that the wisdom of the Divine can be discovered deep within your own soul. In other words, your body, complete with its physical, emotional, and mental capabilities, is not the repository of your sacred intentions. Nor is it able to reach out and access this divine inner calling which tirelessly beckons, inviting you towards the glorious joy of ever deeper connection with All That Is. It is the soul that is the harbor of your divine essence. And it is the soul that is the vehicle of access to the awakening of your sacred intentions, which opens the door to profound transformation through the integration of your body, mind, heart, and soul. Through opening to meaningful connection not only with your own divine essence, but with that of all living beings, the experience of profound personal transformation eventually triggers the realization that perceived reality is the Divine personified in the form of individual preferences. Thus when your sacred intentions are fully awakened, divine reality and your perception of reality become inseparable as the wind and the air. This confluence is only completely realized through the full transformation experience, which is unlike anything known within human experience. There have been those upon Earth who have experienced a shallow breath of wind from this powerful tempest. Some have called it ascension; others have attributed names like illumination, enlightenment, nirvana, and cosmic consciousness. While these experiences are profound by human standards, they are only the initial stirrings of divine essence as it becomes increasingly adept at touching and awakening the remote edges of its existence. What most would define as the ultimate bliss is merely an impression of their divine essence whispering to its outposts of form and nudging them to look within to the roots of existence, and to unite with the formless and limitless divine intelligence that pervades all. The full transformation experience is far beyond the scope of the human drama, much like the stars in the sky are beyond the touch of Earth. We can see the stars with our human eyes, but we will never touch them with our human hands. Similarly, we can dimly foresee the transformation experience, but we cannot fully experience it as humans. It is accessed through the wholeness of the soul, for it is only in wholeness that the soul's sacred intentions and their catalytic effect of divine perception can be fully experienced. This level of wholeness is attained only when the individual consciousness has separated from time and is able to view its existence in timelessness. Nevertheless, the human experience is essential in facilitating personal transformation and causing it to trigger – like a metamorphosis – the integration of your formful identities into divine essence. Self-mastery through personal transformation is the next stage of perception and expression for your soul. It is initiated when you choose to design your life based upon principles that are symbolic of the Divine. As you become increasingly responsive to the Divine, you naturally gravitate towards life principles that symbolically express the formative principles of divine creation. The below principles are divine templates of creation. They are designed to help you experience life from the perspective of divine essence. They are principles that construct opportunities for the integration of your formless and formful identities. They are bridges through which you can access the experience of wholeness by perceiving with your divine essence. There is a wide range of means that can facilitate self-mastery through personal transformation and disengage the soul from external controls. Inasmuch as the means may vary, the intent behind the means is quite narrowly defined as the intent to expand into a state of integration whereby all aspects of your conscious self become increasingly aligned with your divine essence. There are three particular life principles that help to align your perspective with the perspective of divine essence and thus inspire profound transformation. When you apply these principles, a deeper meaning will be revealed to the seemingly random events of your life experience – both in the personal and universal contexts. Seeing the Divine in all is the principle that all manifestations of life convey an expression of All That Is. It does not matter how far the unifying energy has been distorted or corrupted; the Divine can be observed. It is the action of perceiving the unification of energy even when the outward manifestations appear random, distorted, or chaotic. It is the realization that all life flows from one divine energy source that links one to All and all to One. The presence of the Divine expressing itself as a vibration of equality can be seen in all things. Sensory input derived from the human body is limited to frequencies in specific ranges that only convey an echo of this divine vibration. The divine resonance of all life is understood only through deliberate and focused contemplation of the equality inherent in all things, and through the ability to penetrate beyond the image of a thing to the origin of the image. These insights stimulate a new sensory system beyond the five senses that rule the physical world. These new senses are an outgrowth of the awakening of your sacred intentions. They are manifestations of the first stage of personal transformation. With this new perceptual ability, you will be capable of sensing not only the presence of the Divine, but also the timeless divine essence within all life that is individualized and uniquely separate from the Divine. Calling forth the divine perceptions of the soul within your own being is the ideal method to access lasting sensitivity to the divine vibration. This is how you develop the ability to see the Divine in all. It is not only that the Divine is found within you and within every individual manifestation of life; it is also in itself the wholeness of all life. Thus, this principle calls for seeing the Divine in all its diverse forms of manifestation, as well as in the wholeness of life itself. Life, in this definition, is an individual's sovereign reality. It is subjective and impressionable. Life is the wholeness of experience flowing past the individual's field of perception in the present moment. There is never a closure to life, nor a final chapter written. It is eternal, not so much in the abstract sense of never ending or beginning, but rather in the real sense that life is ever expanding in order to express divine intelligence in all realities within the universe. The nurturance of life is essential to both personal and collective realities within the universe, which contains all realities that are interlinked like threads of an infinitely expanding fabric. Thus, as you awaken to your own creative power to transform life energy outside of yourself and enhance it with the clear intent of gentle support, you naturally experience ever-unfolding transformation within yourself as well. You become an increasingly clear beacon of the Divine and the architect of a new paradigm based upon the intention to nurture all life in the universe. This principle is based on the understanding that the universe represents a collective intelligence that can be personalized as a single universal soul – a composite expression of the Divine. Thus, in this perspective, there are only two souls in the entire cosmos: the individual soul and the universal soul. Inasmuch as the individual is impressionable and constantly changing to adapt to new information, so is the universal soul, which is a dynamic, living template of potential energies and experiences that are coherent and as knowable as a friend's personality and behavior. Everyone is indeed, at their innermost core, a sovereign soul that can transform themselves into an instrument of divine essence. However, this transformation is dependent on whether the individual chooses to project an image of divine essence upon the "mirror" of the universal soul, or to project a lesser image that is a distortion of its essential state of being. This process involves an interchange of supportive energy between the individual and the universal soul. This energy is best applied through an appreciation of how perfect and exacting this interchange occurs in every moment of life. If you are aware – or at least interested in having the awareness – of how perfectly the Divine, as expressed in the form of the universal soul, supports your sovereign reality, there is a powerful and natural sense of gratitude that flows from you to the Divine. It is this wellspring of gratitude that opens wide the channel of support from the Divine to the individual and establishes a collaboration of purpose to transform the individual soul into a pure expression of divine essence. When you choose to align with divine essence and to live from this perspective as part of an ever-unfolding reality, you attract a natural state of harmony. This does not necessarily mean that your life is without problems or discomforts; rather it signifies a perception that there is an integral purpose in what life reveals. In other words, life experience is meaningful to the extent that you choose to live in natural harmony with the multidimensional aspects of divine essence. When your personal reality flows in alignment with divine essence, you create lasting joy and inner peace. Thank you for taking the time to read this empowering essay by WingMakers. Note that the text you've just read is a slightly edited translation into everyday English from the esoterically worded original. The original essay, titled Life Principles of the Sovereign Integral, is available here. Should you be interested in the origins of this engaging WingMakers material, click here to read some of the strange and fascinating history. If you found this WingMakers essay to be meaningful, you might appreciate two other inspirational writings. The first is a concise, two-page essay which describes the deeper levels of what's happening in our world and gives empowering suggestions on what we can do about it. Titled Building a Brighter Future, this compelling summary is available here. The second is an inspiring essay of two-pages titled Simple Keys to a Fuller Life available here.